Today we are interviewing J.-F. Bouchard, author of "How To Build James Bond's Unshakable Self Confidence." I was born in Trois-Rivieres, Quebec. Studied computer science, networking and Information security as well as behavioural psychology. My work as an International Information Security Consultant for Military and NGO organizations led me to work in some of the world's most dangerous places such as Afghanistan and Iraq. As an International Information Security Consultant, I found myself doing everything from flying helicopters and performing car stunts to mastering body language everywhere from boardrooms to war zones. Close friends started to call me James Bond in relation to my expanding skill sets and fearless way I was taking on challenges one after an other, but mainly because of where I worked and the lavish lifestyle I was sporting. I founded SuperSpyMe.com to reach out to all of those who needed help raising their confidence, self esteem and become their own version of James Bond. The book enables struggling folks to harness the power within to conquer fear, expand comfort zone and life a full life. In a few pages I managed lay the foundation to raise a plan that works with achievable objectives to tackle anything life can throw you. Anyone that needs a good system to get over lifelong fears, set a good foundation to tackle comfort zone expanding challenges. The book is based around your self-developed S.M.A.R.T. objectives. What can you tell us about these objectives? SMART is a system that enables the user to set achievable goals in a timely manner. The point of those objectives are the foundation you need to tackle any kind of projects. Not just Self-confidence boosting ones. When someone has purpose and direction his chances of success are very high. That is why I deemed it was important to bring this up at the beginning of the book. How did you decide upon which specific objectives to work on with readers? To be successful you need a plan, Sun Tsu, Machiavelli, Napoleon, Julius Caesar will tell you that. If your objective is to rise your confidence to James Bond’s level you definitely need to have the tools to make it so. That was a must in my view. Then, one needs to conquer his Fears. Fear is the number one reason people are lacking confidence; fear hold them down, tucked in the comfort zone where everything is safe and predictable. Sometime a little push is all you need and so I added a few “hacks” to use in your daily life that can make a measurable change in how your confidence rises. Things like your body command your mind and vice-versa. Holding a power posture will make you brain feeling it is powerful. Proven scientifically. What are some of the benefits of building confidence? Confidence is the difference between great success and dashing character and low self esteem scared chap. Confidence brings you where you want to go. Not where life brings you and to me this is a huge difference. Use the tools. Set crazy goals and achieve them. Overcome their fear and become the leaders they deserve to be. Once you understand the power of achievement you’ll be more incline to tackle bigger challenges and start being successful. There is no better way to confident than to be achiever. If only 1 reader gets the point and accept change. I’ll feel accomplished, and the purpose of the book would have bear fruits. 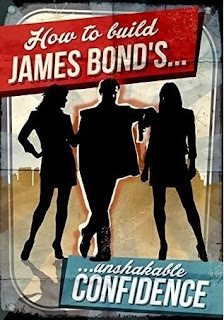 I’m already half way through the companion book for "How to Build James Bond’s UNSHAKABLE Confidence," it is a mission style book filed with challenges. There are 7 categories missions to pick from. The idea is to work on the weak spots to make them stronger rising confidence in that field, expanding comfort zone and start achieving to grow James Bond confident. It is a request from readers who what to have concrete examples on how to work the SMART system.